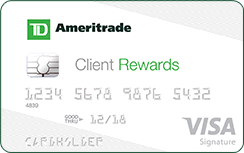 TD Ameritrade Client Rewards Card is typically available to those with excellent credit scores (650 or greater). Ameritrade clients looking for a way to grow their account with their everyday spending will find a solid, low-risk choice in the TD Ameritrade Client Rewards Card. With no annual fee to worry about, it works great as a “fire and forget” way to earn rewards for your account.